Pleco has Ich? White Spots on Plecostomus Catfish? Topic: So my Pleco Fish has ich and is acting very sick. I thought catfish didn’t get ich but apparently I was wrong. How should I treat the plecostomus? He is just a common Pleco species. Need some help here. Try upping your water changes more. 75% daily and it’ll clear up. What’s the tank size? Fix him up and rehome him unless you’re planning on upgrading. Not trying to sound mean or anything. But they grow quite large. HELP!! I just did my first water test in a month because my one angel fish is not acting himself. I’ve been dealing with ich on my pleco fish (but no one else ) for about a week. I’ve only been treating with heat and water changes because all the meds I find are not safe for my pleco. Despite his ich he is acting very active and eating. Why are my parameters a mess??? What should I do!? Your cycle crashed for some reason. Did you change filter media or something? You need to do daily water changes and add prime until you are back to 0 ammonia and nitrite. Water changes and adding prime (to detoxify the nitrites) also add some bottled bacteria. Sorry I edited to add to my original comment. New royal pleco has ich what’s the safest way to treat him. Already added him to the main tank a few days ago. I don’t think he brought it. He didn’t have it in qt. I think it’s probably related to the power outage I had. I’m just fairly certain they are sensitive to treatments. I don’t want to go trial and error on him. 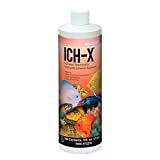 The whole tank needs to be treated most meds you will need to do half dose I have used nox ick at half dose and has worked but there are some out there made for scaleless fish just can’t think of them names. Plan on treating everything. Just worried about how to go about it. Haven’t had a full out ich outbreak since my first set up. And I used kordon ich attack because it was supposed to be safe and it still nuked everything that was scaleless. Maybe I’ll try it again with a lower dose. Usually if I catch early on what I think is ich starting to appear I can usual clear it up with heat. No luck this time. Seachem Paraguard combined with API Triple Sulfa for US folk. Paraguard can be used at full strength as Triple Sulfa will buffer the med and also serve to stave off any secondary bacterial infections. Was using the kordon rid ich plus, it still killed the pleco within two doses. And what was a very mild case of ich is severely out of hand now. It simply isn’t working. I have a beta tank that has been fully cycled. Put an albino pleco in without quarantining (lesson learned) and it spread ICH to my beta and dwarf frog, both which ended up dying. Now I come home from work to find my pleco dead. Ammonia 0.25 (which is baseline because I have ammonia in my tap water) Nitrites are thru the roof- greater than 5 and Nitrates are 20. Why are my nitrites so high? I’m assuming that’s why my pleco died. In my community tank I have a Julii Cory that has Popeye. Ammonia is 0.25 Nitrites 0 Ammonia 20-30. What is the best treatment? Unfortunately dear, you aren’t cycled at all. To be cycled, your levels must read: 0 ammonia, 0 nitrite, and 5-20 nitrate. That means you are cycled. But I am cycled and have been for quite some time. I will never have 0 ammonia. My water has been testing Ammonia 0.25 Nitrites 0 and Nitrates 20 for months. Just now did I have a spike in my nitrite level. Just wondering why. Never happened before. What not nice things do you have to say? I have had this beta tank fully cycled for months. Had successfully kept a beta and dwarf frog in it for months. Only thing I did different was added an albino pleco that had ICH. I am diligent with water testing and water changes. What am I doing so wrong that you have nothing nice to say? Please explain, I am not seeing where you are coming from. Besides the 0.25 ammonia coming from the tap, the dead fish decomposing may have contributed to the nitrite spike. Traces of ammonia in tap water are common, using a water conditioner such as Prime to lock the ammonia up until your bio filtration can deal with it is your best bet. Go back 7, maybe 8 years API had a run of ammo tests that were showing 0.25 on everything, tank water, RO, you name it. While they are sufficient for hobbyist use they are far from laboratory grade tests. Regardless, it is something I would keep an eye on, and sorry you had to learn the hard way about quar. A cycled tank should handle .25 Ammonia in under 24hrs (less usually, but there are a lot of variables). So it shouldn’t be constant. Please provide both tank sizes, complete stocking lists, and temp and Ph. Also provide brand and model info for filters. Popeye is almost always caused by continued exposure to poor water quality. What is your maintenance schedule? What exactly do you do, and how often? Your tank may or may not have been cycled, it’s definitely not cycled now. If it was cycled, something broke the cycle. “Cycle” refers to maintaining enough healthy, nitrifying bacteria to keep your tank’s ammonia and nitrite at 0. Just in case there was confusion on terminology. The beta tank is 5 gallons aqueon brand with built in filter. And the only fish in there was the pleco. I last tested Tuesday and did a partial water change (20%). No fish in there now. I plan to leave it until water parameters return back to normal. The beta and dwarf frog died on Monday and I did a 20% water change Tuesday. Maybe my ammonia spiked because of the dead fish l and I’m now seeing the nitrites spike and ammonia back to normal. I know the 2 are linked so you don’t have one go up without the other going up. And yes I know what cycled is. There is no confusion. As for the community tank. This is one of the fish that I recently bought from my lfs(Petco) Didn’t have Popeye, that I noticed until yesterday. I last did a water change on Tuesday as well (25%) The tank is a 20 gallon. I have 5 guppy, 1 bigger Platy, 1 albino Cory, 4 Julii Cory, 1 bumblebee goby, and 1 common pleco about 5-6 inches. I have been running the tank temps higher at 86° for ICH due to lack of quarantining (big lesson learned). Everyone else is happy and active and healthy. No further signs of ICH noted. I plan to do a water change this morning for the Popeye. I do weekly water changes with a gravel vacuum and use Prime. A betta, dwarf frog, and pleco in a 5gal all-in-one, all stressed from ich would definitely spike ammonia pretty high, pretty quickly. You may want to pick up some pure ammonia, if you leave the tank empty and bacteria unfed you’ll lose whatever cycle you have and you’ll have to restart from scratch. The 20gal has some stocking issues as well. You didn’t answer my questions on maintenance routine and schedule. There is no pleco species that should ever be kept in a 5gal for long. 1 albino Cory- Albino Corys are shoaling fish. You need 6+ (bronze are same species, juli don’t count). 4 Julii Cory – require cooler water 74-75. Also schools of 6+. 1 bumblebee goby – need schools 6+. More aggressive than your other fish. Likely bully. 1 common pleco about 5-6 inches- common plecos should not be kept in tanks under 75gal, and most people will say bigger (125+). They get huge and have enormous bioloads. Depending on filtration, this tank could be over stocked due to the pleco. My long fin pleco has turned into a jerk since I started treating the tank for ich. I generally feed sinking cichlid pellets and algae wafers. He eats the wafers while everyone else enjoys the rest. He’ll also clean up whatever is left over. Today he swam around and collected all the pellets and wafers and put them in a corner. He proceeded to cover his loot with his body while he ate and shooed off anyone who came around. He was particularly mean to my catfish. He is a jerky jerk. I hope he settles down after the ich is gone.